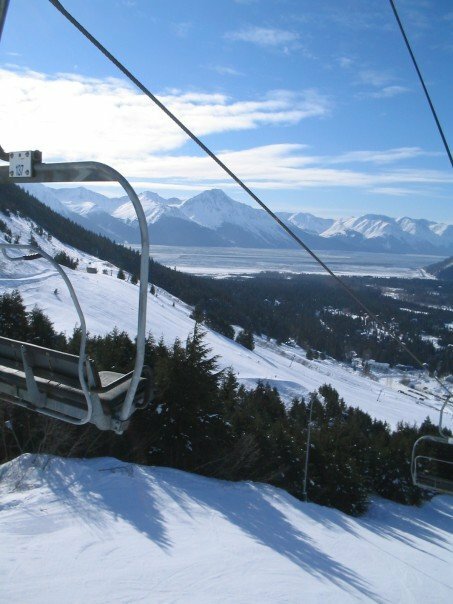 Alyeska, where I learned to ski in 2007. Normally, Mondays are days I don't particularly look forward to. But this Monday was...awesome. I booked my flight to Kelowna, British Columbia for my first real ski trip "out west." For someone who's grown up on the East Coast and spent the last few winters skiing in Pennsylvania, I'm not entirely sure what skiing "out west" entails, but I know it's going to be awesome. 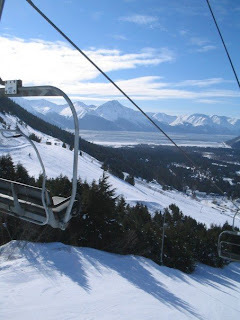 That winter, I spent almost every weekend at the Alyeska Resort outside of Anchorage. After a month of skiing, my "instructor" finally let me use poles, and I finally figure out how not to trip over them. I still don't plant them properly, though. So, after much deliberation, waffling, and general arguing both internally and out loud, I booked my flight to British Columbia to ski at Revelstoke. Life's full of trade-offs, and I knew there would only be one big trip this winter. But I'm psyched that this is it! We'll spend a few days wandering around the Kelowna area, hopefully discovering a handful of outdoor adventures to be had. Then our little group will head to Revelstoke for several days of jaw dropping views and feet of beautiful snow. I'm not going to lie, I'm nervous. As far as skiing goes, I'm about average, and I'm going to British Columbia to ski with a few folks who are, to say the least, incredible skiers. Black runs here in Pennsylvania give me a run for my money, and I didn't make it down a single black run at Alyeska without biting it at least once. A few days at Whiteface Mountain outside Lake Placid, NY last winter left me a little more fearless. But after several hours of steep skiing, my legs are jello, and concentrating enough not to fall is quite challenging. I know powder is akin to gold for skiers and boarders, but I have absolutely no idea how to ski in it. The closest I've come to skiing powder was sloshing through inches of fluffy snow that had fallen one day at Alyeska. That was three years ago. Nerves aside, I'm beyond excited. I can't wait for the Canadian Rockies to take my breath away. I'm guessing just sitting at a window staring outside would be enough to keep me occupied for the entire week. 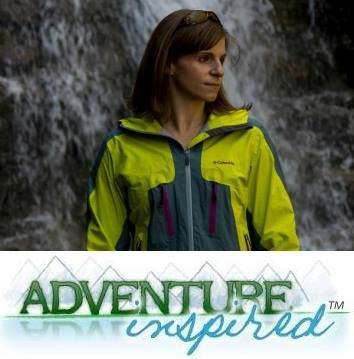 But, this blog is called "Adventure-Inspired" after all, and I'm so looking forward to taking on the challenge of skiing in a brand new place, and learning as much as I can. All of you skiers out there, what advice do you have for someone who's about to go on their first real, honest-to-goodness ski trip? I've got two months to get myself ready! Bring icy hot, whiskey and don't forget to drink water on the slopes. You're sweating and you don't even know it, so its easy to get dehydrated! Thanks Aaron! I definitely don't hydrate as much as I should, that's a good one. And Patrick, that's a legit piece of advice! It happened to me in Alaska; I just came to a complete stop, tipped over, and couldn't get back up! Great advice from @jenhuicheung - Wear a helmet even if you are confident about your skills but because of others and their skills (plus, accidents happen), rest when tired and don't push self, especially at end of day when most injuries happen. Get lots of sleep, avoid alcohol, and bring some NSAIDs just in case! By the way, Smartwool ski socks rock. Bring energy chews or bars. Wow, that's cool that we had the same figure skating --> skiing experience (after snowboarding for years, I tried skiing and wished I had just started out skiing b/c it was SO much more natural). Fresh powder is really fun to ski (unless it's really bumpy). It's very forgiving (doesn't hurt to fall) and you can make big sweeping turns. You'll like it! The main thing you need to do (or at least what I do) is lean back a little more than usual so you don't plunge your tips down into powder and get stuck. Do lots of plyos and ski squats, and the more skiing you can do, the better! When you are at the resort, remember that accidents happen later in the day when people are fatigued. Keep well fed and hydrated and stay within your comfort zone. Most of all HAVE FUN!!!! The Rockies really are a different ballgame than skiing out east. The runs have the same rating but they are definitely not equivalent. The green runs will be groomed and won't have much powder to navigate. The earlier you can get to the hill the better. I always try to get there right when it opens so it doesn't get tracked out and there are less ppl/shorter lift lines. Also try packing a lunch/thermos if you can as the chalet's can get really busy and really expensive ($30 for lunch for 2). If you pack a lunch the bonus is you can eat on the outdoor patios and enjoy the views! Pre-trip: Definitely work out the legs at the gym - do side-to-side lunges with a weight ball. Also, hold your body in ski stance (legs slightly bent, leaning back slightly, arms out like holding a beach ball) and jump back and forth over a line. You'll be in pain the first day or so but it will ease as you do them more and more. Those will help develop those ski legs! Plus, I bet leftover Rainier muscles will help out too! Ski: Definitely stop when tired, I've found that to be helpful, even if the head says "NO, ONE MORE RUN!" One more run can lead to one unwanted visit to a hospital (sorry, was just involved in a bad ski accident, ski head is sensitive). Revelstoke is really steep! The green run (yup, there's only 1, really) is a switchback mountain road which winds its way down the hill; a lot of other runs cross it. This means you can always try a nice-looking blue or black section knowing you'll have a chance to bail onto a hairpin and pick up the run again further down. We also thought the grading was a bit tricky- perhaps it was the early season conditions, but some of the blue runs in Revy would be black runs elsewhere. Revy also doesn't do black single and double diamonds - they're just black. This made me a bit tentative as we did one or two which were totally fine, whereas other black runs we saw looked a lot more serious. Local knowledge would be key here, I'd say. Looking at other skiers/boarders, there is some serious talent on the hill. We didn't venture out of bounds into the backcountry but there are a *lot* of folk doing it, judging by the number of transceivers I saw strapped to people at lunch. The North Bowl area was excellent - great snow, lots of tree runs and lots of nice tracks to explore. The views are glorious, too, although we did have a bit of fog. Like all resorts in North America (it seems to me), there are no issues about eating/drinking your own lunch in the cafeterias. This is a wonderful surprise for someone used to eating sandwiches on a lift in Europe and getting shouted at for using the loo in a restaurant! The main space is at mid-mountain, prices are high, though. Good snacks to take include almonds or brazil nuts - I have no qualms about the calories when exercising in the cold! There wasn't much at the base station so don't expect to be able to hang around on the hill, get back to town! Have a brilliant time and enjoy Kelowna too. Big White's nearby if you fancy some other skiing, and Kelowna itself is stunning. Have fun! Thank you all so much for the helpful hints, insider info, and workout tips! Hopefully, I'll have a post up in February about how much fun we had thanks to all of your help!